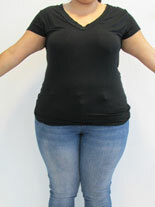 Full body sculpting by a female plastic surgeon who knows where you need it--without the surgery! Are you ready to shrink a size...without surgery? Our Lipo Queen™ "Total Body Contouring" shapewear is made from a strong, breathable fabric, perfect for under that clingy evening dress during these hot summer months. It fits like a second skin, smoothing out your bra fat, back fat, saddle bags and inner thighs with our "surgically placed" panels. Invisible under your skinny jeans, the signature lace cuff won’t roll up your thighs while you’re sitting. Shoulder straps keep the upper half of the garment from rolling down around your waist (sound familiar? ), but won’t dig into your skin. "Not only does it shrink me down a size under my clothes when I go out at night, but it gives me great back support during the day." Karen N.
"It just shrunk me a jeans size." Anne T.
"After my mom and my aunt saw me in it, I had to hide mine from them until theirs arrived." Lynn V.
"I hated wearing all of the other garments I've tried over the years. This is what I want on me all the time." 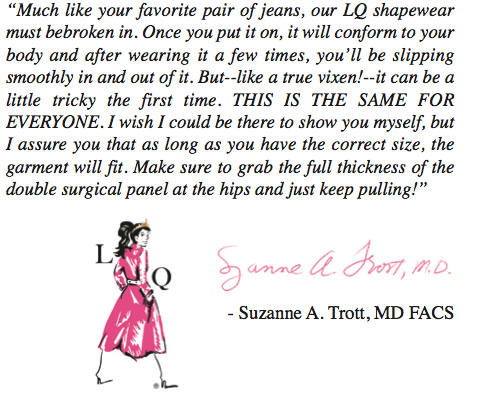 Lisa P.
“Best body girdle by Dr. Trott that truly accentuates a woman’s figure…must have! Absolutely love it! Every woman should own one!” Najwa K., via facebook. “Ah Lipo Queen, I adore your posts. I am deeply impressed by you on the beach in your Gotcha bikini bottom and yes indeed, this teeny piece of marvelous material deserves its own silver frame! I’d wear those Mui Mui cork wedges today, and your Nicole Miller story really made me laugh. But, I’ve got one for you now. As a true sixty-five year old I just don’t want to come under the proverbial knife – not even yours and I KNOW you’re the best. I’m a mother and grandmother and don’t want to go into the sad details about my naked self or aged bod in all its natural glory BUT…. In your LIPO QUEEN garment under my clothes that same old bod is suddenly thirty to forty years younger and FABULOUS. Seriously. I can wear tight-fitting clothes, belted, and still get compliments on “my amazing figure” when wearing the garment under my clothes. In my Lipo Queen by Design Veronique Shapewear my bod is firm, flat-bellied and perky breasted and it really does look “natural.” Good thing my sweet old hubby is too kind to complain when I take off the garment at night. You truly truly rock!! BTW, my face is pretty darn good too – thanks to you! !” Penny A., comment at Lipo-queen.com. To order your Lipo Queen Shapewear, contact us today!